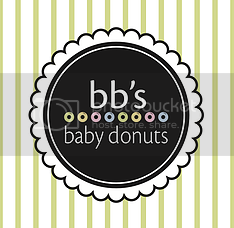 Tales of The Baby Donut: HIP HIP HOORAY - BB'S APPAREL SAVES THE DAY! HIP HIP HOORAY - BB'S APPAREL SAVES THE DAY! almost all of us have been there in those frantic moments, rushing to the hospital, because the baby is coming now. once your little bundle of joy arrives and all is calm, you realize that you just might have forgotten a few things. 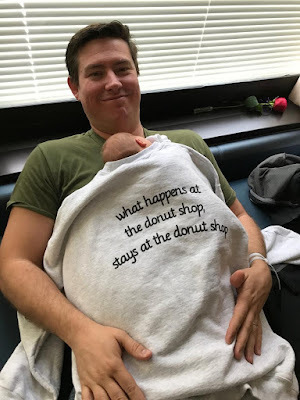 this is just what happened to Marty Gavin of Western Springs, one of our frequent customers, when his twins Holly and Samuel were born just a few weeks ago! once the babies were delivered safely and nighttime came, Marty knew he wanted to stay at the hospital overnight, but didn't have anything for his head! as a last-ditch effort, he walked down to his parked car to search for a blanket or something to make his night a little more comfortable. all he could find was a sweatshirt.... a BB's sweatshirt! he ended up using our comfy apparel as a pillow that night and wrapping his babies in it that morning! that's Marty and his little girl, Holly Yvette Gavin, in the photo above! welcome to the world Holly + Samuel! we're so happy to see you already loving BB's! BB's apparel! we have t-shirts, sweatshirts, hats, and more.